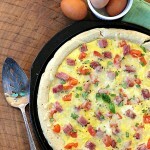 This easy breakfast quiche uses a prepared pie crust for convenience that’s perfect for brunch. 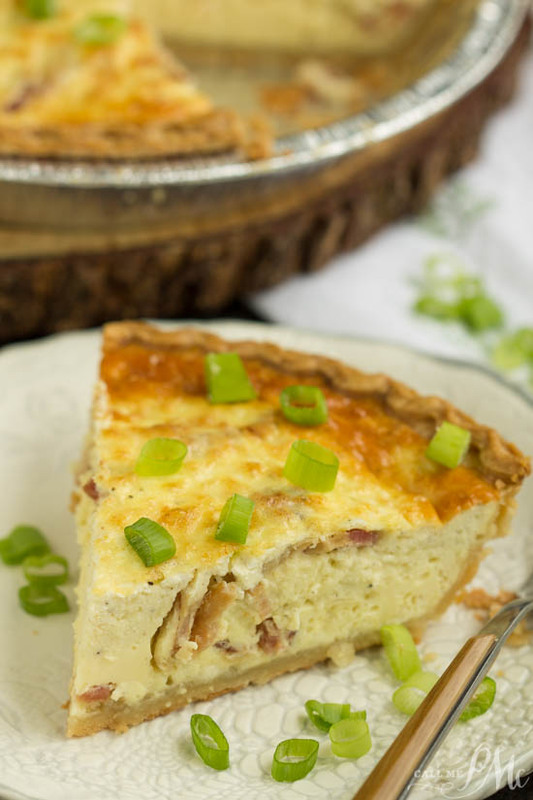 Bacon Havarti Quiche Recipe is a delicious combination of eggs, Havarti cheese, bacon, fresh herbs, all cradled in a delicious thin pie crust! 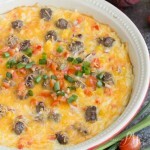 A flavorful savory addition to any brunch, quiche is a great way to use up leftover meat and veggies. 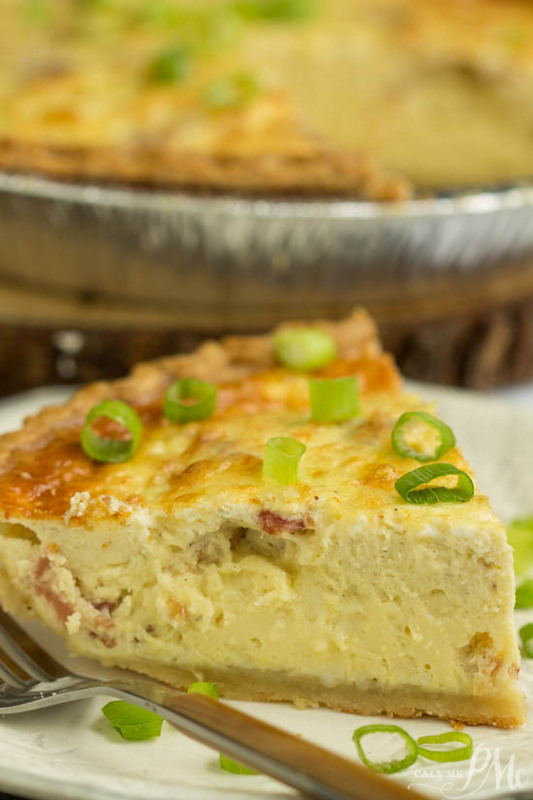 Bacon Havarti Quiche Recipe is perfect for breakfast, lunch or dinner. I opted for a pre-made pie crust for convenience. Fill free to make your pie crust, if you prefer. You may want to try my easy Never Fail Pie Crust or a healthier version, Coconut Oil Pie Crust. For the cheese, I use a mild and creamy Havarti. However, you can use your favorite cheese or what you have on hand. A mix of 4 ounces brie cheese and 4 ounces Havarti make a nice combination. 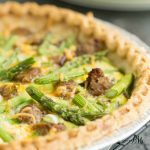 Swiss or Provolone cheese are also nice, mild cheeses and work well with the flavors in this quiche. Finally, for the bacon, well the only option for bacon is extra bacon! 😆 Seriously, you can substitute pork sausage or ham. I cooked and drained the bacon beforehand when I was cooking breakfast. By doing this, all you need to do is put the quiche together and bake it. Cook the crust 5 minutes before filling. Additionally, cover a cookie sheet or cookie sheet with aluminum foil then place your quiche on it. As a result, any overflows will land on the cookie sheet, not your oven. It’s also easier to get the quiche in and out of the oven. 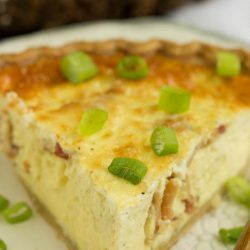 To reheat frozen quiche: Quiche can be frozen prior to baking or after baking; baking first may make the quiche a little easier to maneuver in the freezer. 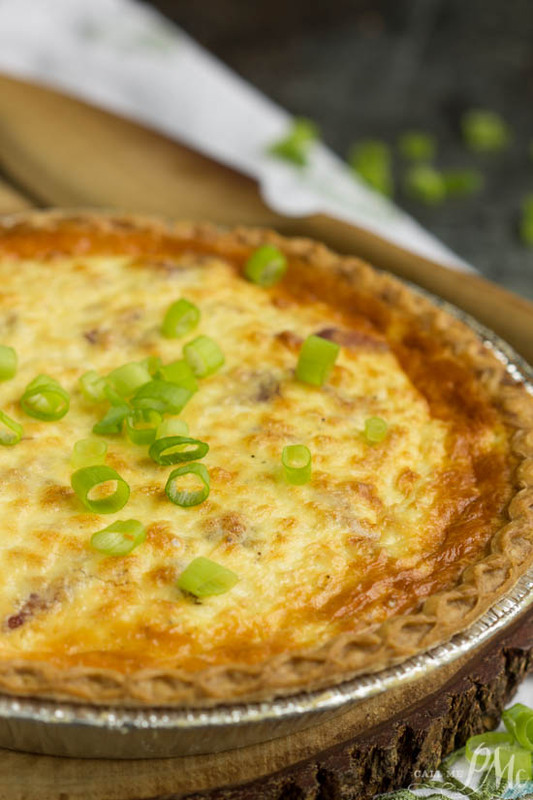 To freeze quiche before baking: Place quiche on a tray or baking pan and freeze until firm. Wrap with freezer paper or heavy-duty aluminum foil or slide quiche into a freezer bag. Seal, label, and freeze for up to one month. When ready to serve, remove from freezer. Do not thaw. Unwrap and bake, as usual, adding 10 to 20 minutes extra time. To freeze quiche after baking: Proceed as above. Do not thaw before reheating. Remove wrap and bake in a preheated 350°F oven for about 25 minutes, or until heated through. 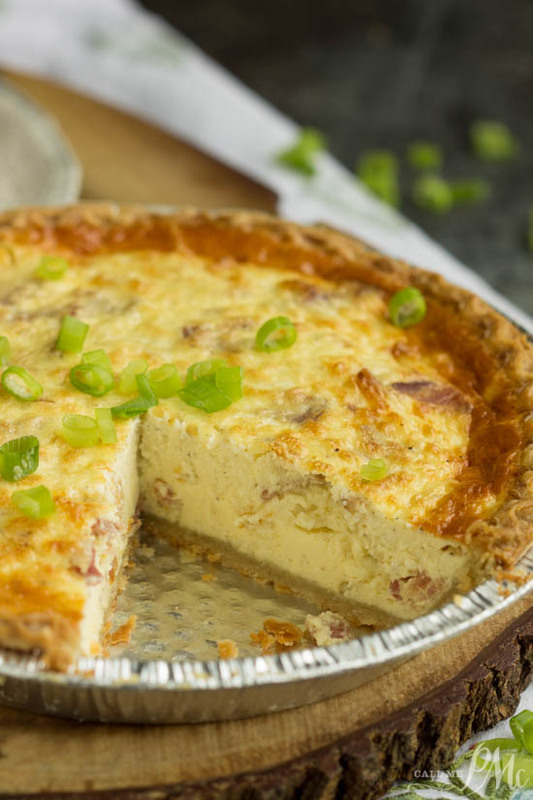 This easy breakfast quiche uses a prepared pie crust for convenience that's perfect for brunch. 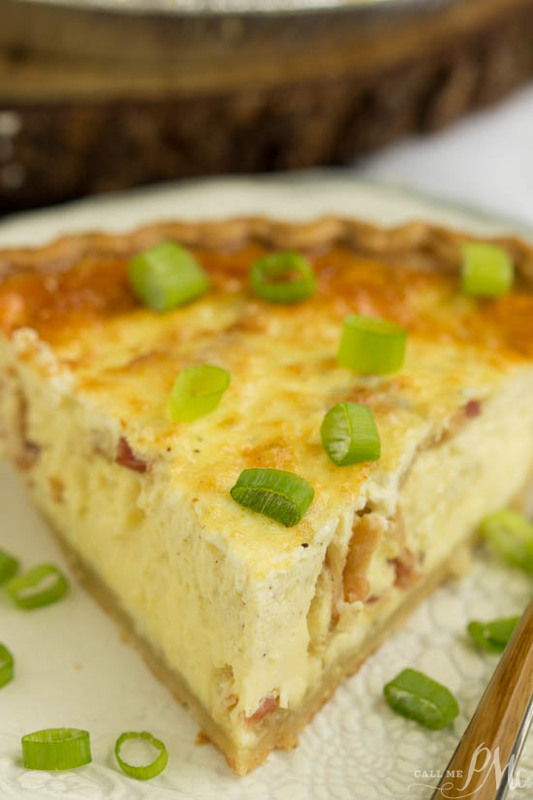 Bacon Havarti Quiche Recipe is a delicious combination of eggs, Havarti cheese, bacon, fresh herbs, all cradled in a delicious thin pie crust! Heat oven to 375 degrees F. Place pie crust on a sheet pan and pre-cook the pie crust for 7 minutes. Spread cheese in bottom of cooked pie crust then top with the bacon. 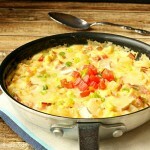 Whisk the remaining ingredients together and carefully pour over the cheese and bacon. Keep quiche on a sheet pan to catch overflows and bake 40 to 45 minutes or until cooked through and set in the center. Cool 10 minutes before cutting and serving. 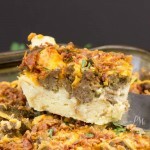 We prefer crusstkess quiche and I’m wondering if I could just put the filling ingredients in a greased pan to bake to accomplish that or if there is some adjustment I need to make to make this crustless. Yes, I would just use the filling ingredients in a pan and bake. Baking time should be 5 or so minutes less. Your picture shows a coconut cream cheese pound cake recipe , but when I went into your site it was nowhere to be found, even after wading through all your other recipes?